It looks like my blog has been very quiet for a while once again. Yes, I’ve been busy working on some other SQL Server projects since last year. One of those projects was working on Kalen Delaney’s new book SQL Server 2012 Internals where I co-authored two chapters, “Special Databases” and “Query Execution”, which were originally written for previous versions of the book by Kalen and Craig Freedman, respectively. The book was finally released last November. 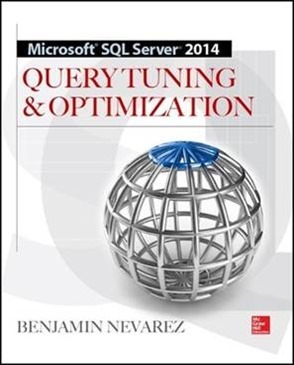 As soon as I finished my part on Kalen’s book, I immediately started working on my new book, SQL Server 2014 Query Tuning & Optimization, which has been available for pre-order at Amazon for a while now. This book covers everything you need to know about query tuning and optimization for SQL Server to help you design high-performing database applications. As a SQL Server 2014 book it obviously covers new features like Hekaton, the new cardinality estimator, and incremental statistics, among others, but most of the content can be used in previous versions of SQL Server as well. I am currently working on the last items of the book with the great team at McGraw-Hill Education and the help of the amazing Dave Ballantyne (@davebally) as technical reviewer and the book should be available soon. Also, at the last PASS Summit in Charlotte I was invited by SQL Sentry to blog at their SQLPerformance.com site, which has great content by some of the most amazing bloggers in the SQL Server community. Although I haven’t had much time to blog there as I would wanted, I have started with a few SQL Server 2014 articles that you can read here. Finally, I have submitted sessions for SQLBits (first time ever submitted) and to the PASS Summit (which I have attended for 11 years so far), and just at the moment I am writing this I got the great news that I got two sessions selected for SQLBits so I am really looking forward to finally attend this conference in the UK this July. I am also planning to attend some other SQL Server events in the US, including our always amazing local SQLSaturdays in Orange County this April 26th, Sacramento on July 12th and San Diego, which is usually scheduled for September. Hope to see you at any of these SQL Server events. In-Memory OLTP, code-named Hekaton, is without a doubt the most exciting new feature of SQL Server 2014. We all first learned about this technology when it was announced back at the PASS Summit 2012 conference where it was also mentioned that it will be included in the next major release of SQL Server. Recently at TechEd North America Microsoft finally announced that this new version will be named SQL Server 2014 and that its first CTP will be available to download by the end of June. So after playing with this CTP for a few days I decided to write a few posts mostly focused on the query processing area of the technology. But perhaps one of the most important concepts we are learning with Hekaton is the fact that even with the new hardware available today, obtaining ten times or more better performance will also require to dramatically change the way data management systems are designed. For example, database management systems were originally designed under the assumption that memory is limited and data should have to reside on disk pages. This assumption is no longer true and currently it is possible to fit entire databases in memory, or at least the most critical tables in an OLTP environment. So taking benefit of this available memory is not just a matter of reading more of the existing disk pages to memory but re-designing data management systems using a different approach to take the most possible benefit of this new hardware. 1) Memory optimized tables. Hekaton tables are stored in memory, all the time. Obviously they are also kept in disk, but only for durability purposes. These tables provide two new kinds of indexes, hash and range indexes, although only the former kind is available on the first CTP. And you may be surprised that memory optimized tables are compiled into native DLLs when they are created. 2) Natively compiled stored procedures. This new kind of stored procedures are first optimized by the query optimizer, like any regular stored procedure, but are also later translated into C code and compiled into machine code. This process again will create DLLs. Perhaps the main limitation of Hekaton is that memory optimized tables could not be altered, they would need to be dropped and created again with the required changes. This is the case, for example, if you want to add a new column or a new index. Obviously, dropping the table would mean first copying its data to another location, creating a new empty table with the required changes and copying the data back, which would require some downtime for live applications. You cannot alter natively compiled stored procedures either. Or even recompile them (except in a few limited cases). In addition, as the data on Hekaton tables change, statistics are not automatically updated, you will need to manually update them using the UPDATE STATISTICS statement. Also, after getting updated statistics your existing natively compiled stored procedures cannot take benefit of it. You will have to manually drop and re-create the store procedure. Let me show you an example of how the technology works, using a copy of AdventureWorks2012 database. First let us create a new database. You cannot copy data directly from a second database to a memory optimized table. So we need to copy the data to a regular table first. 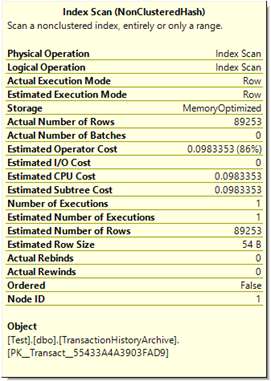 Let us look at our first execution plans using T-SQL against our memory optimized table (which by the way is defined as T-SQL using the query interop capabilities). The execution plans shows the familiar Index Scan and Index Seek operations but obviously the algorithms for this execution are not the same, this time the table and indexes are in memory and use totally different structures. You can identify differences on these operators by looking at NonClusteredHash after the name of the operator and Storage shown as MemoryOptimized in the properties of the operator as shown next. Something that you may notice is that executing the native stored procedure does not show any execution plan. At this moment I don’t know if the plan will be visible on a later CTP or the RTM but assuming it won’t, this may be a problem as we would not have an execution plan to troubleshoot. You may say that we can still see the plan using the T-SQL code but keep in mind that data and statistics may have changed since the procedure was created and so it does not mean that the plan you currently get was the same that was compiled to native code. Anyway, we would just have to wait for the next CTPs and see how is this going to work.